On Sunday, I will be racing in my first triathlon in almost exactly two years to the day. I started sports when I was 6 years old with swimming and soccer. I have always been fairly competitive in my athletic events and though I do not feel that I am very naturally athletic, I have always worked very hard at training and racing and have always loved both aspects. I competed in swimming until I was 18 years old and then started training and racing recreationally in various types of events. Since I was a fairly good swimmer, triathlon was a fairly easy transition for me as many people have trouble with the swimming portion. I just had to teach myself to bike and run a little better. 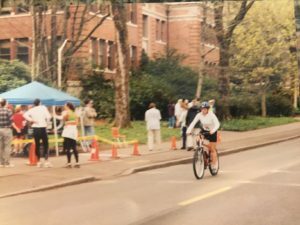 I did my first triathlon at 21 and loved it. Each year after my first race, I would compete in various 5ks, half-marathons, a full marathon, bike rides and triathlons. I would plan my race calendar and would take my training pretty seriously. Finishing my first triathlon in 2002 and yes, that is a mountain bike! As the years went on, I started to get into my career, bought a house and got married so I started to race less and less but was always doing at least a few each year. It was my thing. My hobby, something to plan for and challenge me. I knew that having kids would make training and racing much more challenging but I did not want to give up racing once having kids but, wow it is hard. Once I learned how to do the whole mom thing with Caleb, I was able to get back into a fairly good routine. I like set schedules, especially when training for a race. I also like training with a set schedule from the beginning. I like to be organized and rather strict with my training for an event. I like to know what day I am swimming, how many miles I am running etc. Most mornings, I would get up early and train before work while my husband stayed home with Caleb. I was able to race a few times before I got pregnant again with Madelynn. Though I know many moms continue to race recreationally and compete early in pregnancy, I always chose not to. This is a personal choice as I know myself and know I have a competitive edge and always thought it would be best not to. I never wanted to push myself beyond what I felt was safe for myself or my baby and I did not want to go easy either so I just decided not to compete at all. So once I was pregnant again, I knew it would be at least 18 months before I would be ready to race again. One of my goals this year was to compete in a sprint triathlon and multi-day bike ride now that I am not pregnant or nursing anymore. (Side note: I have trained and raced while nursing and it is completely safe but I found it challenging to train for endurance events as you maybe need to get back from the long workouts to nurse or pump.) I had some major concerns about being able to train and race again now that I have 2 littles. When was I going to possibly find the time? My husband’s job changed within the last two years and he has to leave by 6 am every morning so if I want to workout before he leaves, I would need to be getting up at around 4:30 AM to get to the gym and back home by 6. Ummm, not happening, especially since we have had plenty of sleep regressions with Madelynn and though it has taken me years to realize this, but because I am consistently very physically active my body needs sleep more than a workout 99% of the time. So how I am finding the time to train for endurance events while working full time and 2 littles? I am literally training whenever I can. As I mentioned, I used to love to have a strict training schedule such as swimming on Monday and Wednesdays, cycling these days, lift these days and I would DO anything I could to not vary that schedule. Thinking about how structured I was, makes me laugh as it is not like I was training for the Olympics, but my training and racing used to be a very large part of my life. It was something I could control. Now, it is still part of my life but obviously not nearly as important. Some days I train in the morning, often it is during my lunch hour and with the support of my hubby it is early morning on the weekends. I am being flexible. So now, though I kind of have a regular routine, there are many days I have to be flexible with work and the kids. And be flexible with my body and how I am feeling. If I was up with Madelynn at night and did not sleep well, then maybe getting up early to work out is not happening or if I have not recovered from a hard run or ride then maybe I do an easy swim vs. what I had planned. Having a supportive husband. This is really crucial for me. My husband knows that racing is important to me and I want to do these races. He is very supportive and has the kids during my early morning weekend workouts. However, because my time is also precious with the kids and I cherish my time with them during the evenings and weekends, I am only racing in 2 events this year. I do not feel the need to do more. But I am also not going to feel guilty for pursuing these events as the training is over a short time period and continuing these events is important to me and my identity. I know this might look like a lot of training to most but with the exception of the longer rides, I am never working out more than 60 minutes which for an endurance athlete is actually relatively short. And this is A LOT less than I used to. However, I am only racing in a sprint and have a good base so this worked for me. I am also only working out once a day or only one discipline a day (with the exception of Wednesdays). This again is a rarity for endurance athletes but if I wanted to accomplish this goal, I knew this was all I could and really wanted to commit to. Now, if one of my clients wanted to train for a triathlon I would probably recommend training a bit more, doing every discipline at least twice but for me this is working right now. And I truly believe it is better to be 10% undertrained than 1% overtrained. Nutrition is obviously another huge part of training and racing and I do have to adapt and change this a bit. Here are few ways my nutrition has changed while training. My appetite has increased A LOT. This amount of cardio is WAY more than I have done in probably the last few years and cardio tends to make me hungry. However, I am not eating for fat loss right now, I am eating for performance so I am eating more to fuel these workouts. I almost never lose weight while training for these types of events because the increase in exercise drives my hunger up. I also do not train for these events to lose weight. Eating before I workout. My overall eating changed so much after having kids with the major change being eating less meals overall. I am busy in the mornings getting the kids fed that I often do not eat breakfast until 9 at the earliest. I usually have 2 cups of coffee while the kids eat breakfast. However, now if I am going to be doing longer cardio, I need to eat something. Often it is 1/2 of a protein bar or my almond flour banana bread. Though, I do prefer to work out fasted and can think it can be helpful for fat loss for many people, my goal is performance so eating something helps me perform better in my workouts. More carbs. Oh carbs. Though both the high-carb and low-carb craze seem to be mostly over, I still think people seem to be confused about carbs. I try to get most of my carbs from fruits and vegetables (yes, those are carbs) but I definitely am not in the no grains camp either. I do eat bread and grains but try to keep these type of carbs limited in the evenings since I do not need that energy at night. However, if I know I am going to be getting up early to train, I will try to eat more carbs, often in the form of more starch such as couscous, quinoa, potatoes, etc. So mamas if there is some type of sport you love whether it be 5ks, yoga, biking etc. make sure you make time it. We are all better moms when we take care of ourselves and still pursue some of our passions. I am excited to race on Sunday. I am excited to actually see how I feel and perform compared to 2 years ago after only 1 baby and more training and to 4 years ago when I had no kiddos and way more time to train (To see how pregnancy can actually make you a better athlete, check out a blog I wrote about this topic here). I am excited to have my kids watch me and cheer me on and see what I have worked towards. I do this for me but I do it for them too. I am excited to feel nothing but gratefulness for my body that has done a hell of a lot in the last 3 1/2 years! 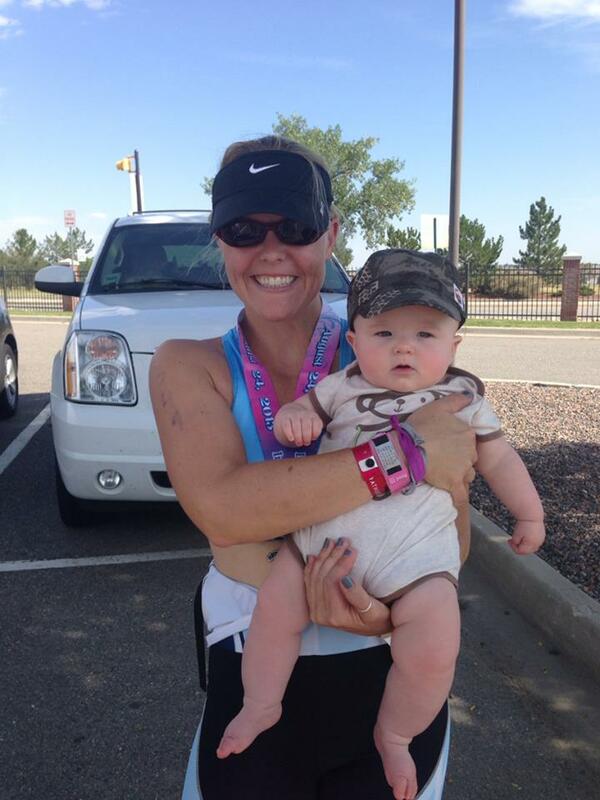 My frist triathlon 5 1/2 months after having Caleb in 2013. If you are looking to change up your routine and commit to making healthy and easy lunches and dinners for Back to School and looking for some fast and effective workouts, join me and lots of other mamas in my FREE Back to School Challenge. We start next Monday. Sign-up here!